From high school dropout to American Idol winner to four-time Grammy nominee, Fantasia Barrino is proof that sometimes life can be a fairy tale. In her empowering stage appearances the soulful songstress discusses the joys and pitfalls of single motherhood, talks openly about her efforts to overcome her difficult past and to become fully literate, and draws on her triumphs as a woman and as an artist to inspire her adoring fans to reach for the stars—and grasp them. The North Carolina native first dawned on the public consciousness with her stirring performances on the third season of American Idol, which prompted Simon Cowell to pronounce her the best contestant of the 70-plus international Idols crowned since the show began. On the lecture stage Fantasia describes her thrill at being voted the new American Idol, and her joy at the success of her debut album, Free Yourself, and its hit track “I Believe”—which made her the first artist ever to enter the Hot 100 at number one with her very first single. She also speaks candidly about her powerful religious faith, and about the painful but cathartic filming of the Lifetime Television biopic based on her bestselling autobiography Life Is Not a Fairy Tale, which required her to reenact both the triumphs and tragedies of her past. A strong woman whose dazzling musical gifts and courageous spirit have been an inspiration to millions, Fantasia is a delightful and engaging speaker who never fails to enchant her listeners, no matter what the topic. Do you want to hire Fantasia Barrino? Directly request a quote. In 48 hours we can send you the availability of Fantasia Barrino If you would like to book Fantasia Barrino, Entertainment Booking Agency is the right place. 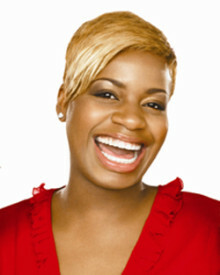 We will offer you the best price and contact the management or we directly contact Fantasia Barrino. For corporate appearances or speaking engagements you can contact our agents and the will help you true the process. Tags: hire Fantasia Barrino, Fantasia Barrino booking, book Fantasia Barrino, Fantasia Barrino appearances, find more information on booking Fantasia Barrino for appearances, Fantasia Barrino speaking engagements, Fantasia Barrino endorsements/spokesperson, Fantasia Barrino appearance fees, Fantasia Barrino booking agency contact info, biography of Fantasia Barrino, Contact an artist booking talent agent find a speakers bureau that can book Fantasia Barrino, speaker booking agency for Fantasia Barrino, Fantasia Barrino booking agency, Fantasia Barrino booking for corporate event. EBA is one of the biggest entertainment booking agencies in the World. We book hundreds of celebrities, artist, athletes and speakers in a year. Important to know is that we are not claiming to be the management of Fantasia Barrino. We are not the official agent for Fantasia Barrino. Companies from around the globe book these artists and speakers true our company be course we have one of the biggest networks and we always have direct contact with the artist or the management. We help you to find the right celebrities for your corporate of private events. Please contact one of our agents to get free advice and we will help to get the world-famous artist on your party.